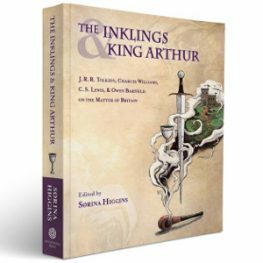 Join us on February 5, 2018, at 11am ET for a roundtable discussion celebrating the release of The Inklings and King Arthur, edited by Sørina Higgins. On February 5, 2018, at 11am ET, Signum University will host a Signum Symposium roundtable discussion celebrating the release of The Inklings and King Arthur, edited by Chair of the Language & Literature Department Sørina Higgins. This rigorous and sophisticated volume of studies does so for the first time. It is edited by Sørina Higgins, with a chapter by Brenton Dickieson (Signum faculty member) and one by alumna Alyssa House-Thomas, contributions from such Inklings luminaries as Malcolm Guite and Holly Ordway, and endorsements by Michael Ward, Owen A. Barfield, Tom Shippey, Verlyn Flieger, Carol and Philip Zaleski, Michael Drout, Janet Brennan Croft, John Rateliff, and our own Corey Olsen. The cover design is by Signum student Emily Austin. Join the editor and contributors to talk about this exciting new book! Sørina Higgins is the Chair of the Department of Language and Literature at Signum University and a Ph.D. candidate, Teacher of Record, and Presidential Scholar at Baylor University. At Signum, she serves as Thesis Coordinator, Host of Signum Symposia, and Preceptor for courses on the Inklings. Her interests include British Modernism, the works of the Inklings, Arthuriana, and magic. She holds an M.A. from Middlebury College’s Bread Loaf School of English, where she wrote about Sehnsucht in the works of C. S. Lewis. She blogs about British poet Charles Williams at The Oddest Inkling. In addition to editing The Inklings and King Arthur (Apocryphile, 2018), Sørina wrote the introduction to a new edition of Charles Williams’s Taliessin through Logres (Apocryphile, 2016) and published an edition of The Chapel of the Thorn by Charles Williams (Apocryphile, 2014). As a creative writer, Sørina has published two books of poetry, The Significance of Swans (2007) and Caduceus (2012), and would be working on a novel or two if she weren’t, you know, in grad school.